Yes, to have a successful blog, you need epic content and a killer promotion strategy. But there’s something else that separates those who win at the blogging game from those who don’t: mindset. If your beliefs about blogging don’t match reality, they could be holding you back. 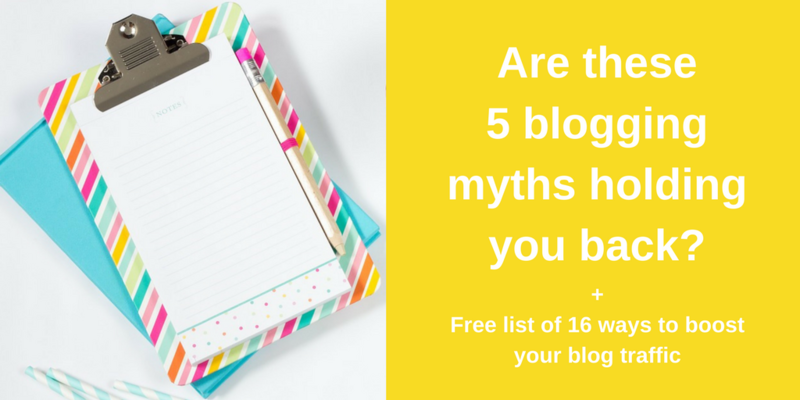 Check out the 5 blogging myths that are still limiting your success. Want more traffic on your blog (so that you can ultimately get more subscribers and make more sales)? Download our free list of 16 tried-and-true strategies for boosting your blog traffic. You don’t need to sell makeup or iPhone accessories to have a successful blog that attracts readers. If there’s a market for your product or service, there will be people who have questions related to it. So why not use your blog to answer them and showcase your expertise? Everyone needs a plumber or accountant at some point. So don’t fall prey to this blogging myth. You may attract more people than you think. Lots of people will tell you that readers’ attention spans are short these days, so short that no one will read a post longer than 500 words. But this is just another blogging myth. People eat up comprehensive how-to guides and other instructional posts because these resources give them the detail they’re looking for. That’s part of the reason why posts with high Google rankings are over 1500 words long. Blogging is time consuming, and it’s hard to publish new content regularly if you don’t have a dedicated content writer working for you. So don’t give in to the blogging myth that you have to publish every day to be successful. Brands that post 1–2 times each month get 70% more leads than brands that don’t blog do. So stop worrying about publishing every day and focus on publishing as frequently as you can while providing value to your audience. Here’s a blogging myth we need to dispel right away: blogging success doesn’t come overnight. It can be easy to blog for a few weeks or months, find that you’re not getting much traffic on your posts, and then give up in frustration. What a lot of people don’t realize when they start blogging is that it takes time to build a tribe. In fact, when Moz CEO Rand Fishkin’s wife started a blog, it took 2.5 years for it to take off. You need time to build a suite of valuable content on your blog and let people know that it exists. Give yourself this time. SEO is an important part of any blogging strategy. It helps you maximize the visibility of your content and the return on investment you get from it. But when it comes to SEO, there’s a blogging myth you need to stop believing: you need to be an SEO expert to build a successful blog. Google and other search engines change their algorithms hundreds of times each year. So unless you have a dedicated SEO expert working for you, you won’t be able to keep up will all the changes. Plus, you don’t need to know advanced SEO to see results. Instead of worrying about every obscure SEO detail, focus on getting the basics down. Learn how to incorporate keywords into your posts, structure headings, and label images. Even the basics can get you far. And in any case, it’s wise to supplement SEO with other blog promotion strategies. These days, there’s so much info about blogging available online. So it can be hard to separate good advice from outdated practices or downright uninformed opinions. The 5 myths above may have seemed like reasonable facts when you first learned them. But they are, indeed, just blogging myths. Don’t let them hold you back from success. ← Loathe vs. loath: What’s the difference?